First off "t'pit" (in the byline) is Yorkshire for "the pit" - not some Vulcan cousin of T'Pol. The canary part I'll leave you to figure out. Secondly, I've never been a fan of Handshake (trust me, I am going somewhere with this). Ever since its introduction in Voyager, I've seen many Handshake-heavy decks. But personally, I always preferred to earn draws through other means (drinking in Quark's for example) rather than expending a card play to acquire draws. Unfortunately, my love of Romulans recently overrode this preference. My desire to build a double HQ Romulan deck (with added Son'a for extra evilness) necessitated using Handshake for draws. It was (regrettably) the most efficient tool at my disposal to get consistent draws, although I longed for an alternative. Third, as some of you may be aware, I'm not a player of 2E or (usually) a user of 2EBC cards. I'm a 1E purist. Of course, one downside of this philosophy has been occasionally sitting down against a Romulan opponent and silently fuming with jealousy that they had a handy 35 point mission to seed directly next door to their Homeworld. Damn that Romulus Region. Why oh why couldn't we have that on a 1E template? So when the Project Chandelier (Star Trek 50) design team sat down to discuss ideas for each series and movie, there was only one thing I had in mind for Star Trek: Nemesis. With Remans yet to be converted, there was a lot of material available, but equally we didn't want to step on the toes of their future design team. The suggestion to convert Remus was one of the least debated and most readily accepted across the set. 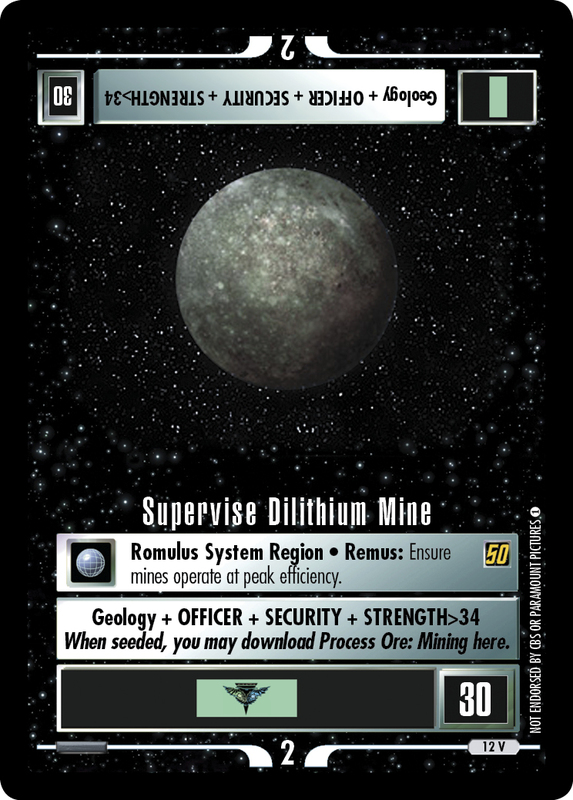 Supervise Dilithium Mine was a popular choice - but how to give it that Mining flavour? Well, at around the same time, Crossover was released - featuring Process Ore: Mining. It seemed like a logical fit with this mission, so we added it as a download. Finally - my Handshake dilemma was alleviated! The Romulans now had an in-built way to reliably draw enough cards to sustain all those free plays - and it was easy to start with 2 Geology (McKay as a mission specialist and Gareb from Admiral Valdore from Drone Control Room, both in the seed phase). Combined with Duck Blind (and potentially using Raptor One and Remote Interference too), I could potentially remove those Handshakes completely (or at least thin them out) and streamline a favourite deck of mine! 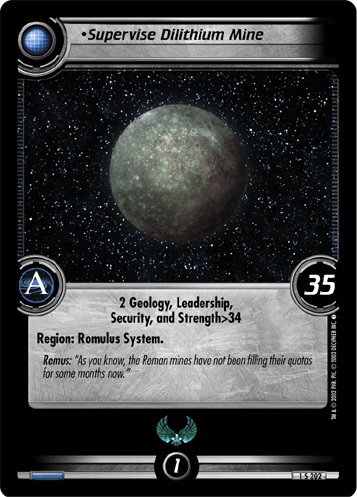 Overall, the utility of this mission in Romulan decks makes it potentially one of my favourite cards in this set. But there are so many good things to choose from! Happy 50th Birthday, Star Trek! Now get back to work and mine me some Dilithium!